Running back Ray Rice carried the ball 16 times for 72 yards against the Bills Sunday, but he is still slow hitting holes. Rice had a similar problem the week before against the New England Patriots. The Ravens are opening holes, but Rice is hesitating, trying to bounce outside or cut back for the home run instead of just blasting through the hole. 3-7-BAL 10 (9:09) (Shotgun) 5-J.Flacco pass short right to 27-R.Rice to BLT 11 for 1 yard (59-A.Coleman). 1-10-BUF 44 (4:54) 27-R.Rice right guard to BUF 43 for 1 yard (99-M.Stroud, 90-C.Kelsay). 2-9-BUF 43 (4:15) 27-R.Rice left guard to BUF 40 for 3 yards (95-K.Williams, 20-D.Whitner). I still maintain that Rice is the most important piece to this offense, but his follow-up to his Pro Bowl 2009 season has been a bit disappointing. Let’s hope he picks things up in the second half of the season. Mr. Reed made his triumphant return to the gridiron against the Bills, and had a huge say in the outcome of the game. Eddie picked off two Ryan Fitzpatrick passes and caused a Roscoe Parrish fumble. The Ravens had only two interceptions in six games without #20, and that total was already doubled after just 45 minutes of football with Reed on the field. The goofy faction of Ravens fans that maintain the delusion that the secondary is better without Reed (due to his “wreckless” play) will point to the four long touchdown passes as evidence that their claim still holds water. To those people, I’d remind them of the big touchdown passes by Denver in Week 5, and the horrendous play by Ravens’ cornerbacks all day against Buffalo. 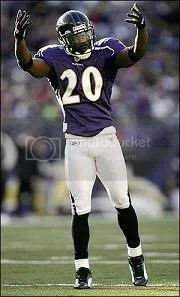 The bottom line is, if Ed Reed doesn’t play Sunday, the Ravens are very likely 4-3 today. Holy shitballs. Where to start? Let’s go down the list, excluding the two players (#20 and #52, of course) named above. Fabian Washington: “Toast” was burned again and again, to the point that, by Fabe’s own admission, Ryan Fitzpatrick was calling him out via audibles at the line of scrimmage. After his great day against Denver, Washington has fallen off a cliff. In New England, he was simply ineffective, and, against the Bills, he had likely his worst game as a pro. Fabe looked completely shell-shocked by the end of his day, which came midway through the fourth quarter when he was benched in favor of Josh Wilson following Fitzpatrick’s final touchdown pass. Haloti Ngata, Terrell Suggs: These two are counted on by the Ravens’ defense to be playmakers. Do you remember hearing either of their named called on Sunday? 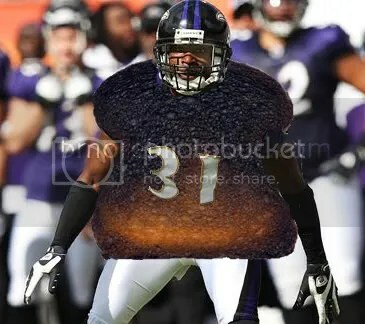 Suggs and Ngata can NOT be invisible, or this defense is in more trouble than any of us realize. Ngata’s play is somewhat excused by the rest of his body of work so far in 2010. Suggs needs to step up down the stretch, it’s just that simple. Edit: Some guys that know a lot more about football than me say that Sunday was actually Suggs’ best day rushing the passer since the Washington game in 2008, despite his not recording a sack. The seven total pressures (a hit, six pressures) Suggs recorded in this game was the most since he recorded eight (a sack, a hit, six pressures) in Week 14 of the 2008 season against the Washington Redskins. Lardarius Webb: He was slowed by a groin wrap, but Webb was the one beaten on the 33-yard touchdown to Stevie Johnson. Webb said he had his groin wrapped as a precaution, but took it off after Johnson beat him for a 33-yard score in the second quarter. “That’s not an excuse,” Webb said. “I’m still supposed to make that play. I took it off then, and didn’t have any problems. I’m thinking I never should have put it on in the first place. It’s the NFL. Everybody makes plays. Webbie also whiffed on several tackle attempts. Dawan Landry: Sure, he had 9 tackles, but how many did he miss? Unfortunately, they don’t keep that stat on NFL.com (well, fortunately for Dawan). Landry has been sub-par in pass support, run support, and general tackling all season. Maybe during his week off, he can go work out with, and get some pointers from, his brother LaRon, who is having a stellar season down in Landover for the Redskins. Jarret Johnson, Paul Kruger, Brandon McKinney, Terrence Cody, Cory Redding: Buffalo averaged 3.8 yards per rushing play for the day, and had 132 total yards on the ground. Fitzpatrick was sacked only once, and it was hardly a true sack (he rolled out on a 4th-and-1 bootleg, and was stopped behind the line by Lewis). Nobody on the defense escapes blame for the Bills’ 64% 3rd-down conversion rate on the day. Just an ugly, ugly performance all around. This entry was posted on October 26, 2010 at 10:47 pm and is filed under Ravens, Ravens Game Recaps. You can follow any responses to this entry through the RSS 2.0 feed. You can skip to the end and leave a response. Pinging is currently not allowed. What’s the deal with “Mount” Cody? I haven’t noticed him much this season. Is he even getting much playing time? I think he made his first tackle of the year Sunday. I’m not hearing good things. I don’t think no news is good news in this case. Good news would be hearing his name called 3 or 4 times a game for tackles in the backfield. Yeah Flacco was everywhere, so I figured I didn’t need to jump in too.